Our master blacksmiths can create custom, ornamental door and gate hardware in any design that you can dream up. These are all fine art quality products, and each is individually, hand hammered into shape. Our hardware is never cast, drop forged, or mass produced, which makes for an end product that is uniquely yours. 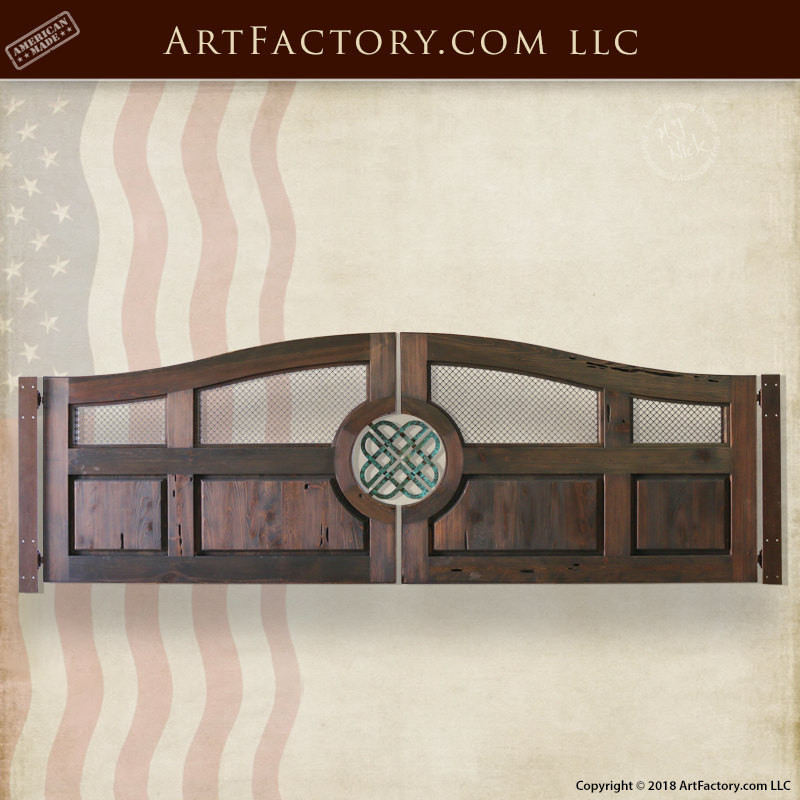 At ArtFactory.com, our custom wooden driveway gate can custom built to fit any size driveway. This gate, as shown, is 12 feet wide and 4 feet tall at the center, and is built from 4 inch thick, solid timber. In fact, we have no limitations on size or thickness when it come to building custom gates. We specialize in designing, and building custom gates that will make a statement at the front entrance of your property. Constructed from genuine, solid wood, with hand hewn, mortise and tenon joinery, these stylish wooden gates are built to stand the test of time. It features a distinctive arched top to provide additional height. The hand forged wrought iron, decorative Celtic knot in the center of the gate is the work of our mater blacksmiths. Each piece is individually hand hammered into shape, and we can add ornamental ironwork to your gate in any style of design that you can imagine. This custom wooden driveway gate, and all of our wooden gates are built from all natural materials. It is our belief that using natural material is especially relevant when creating fine quality wooden doors, gates, and furnishings. Additionally, like all of our wood products, it has been finished to fine art quality specifications using a multi-step, hand rubbed process. We begin with fine hand sanding, and infused open grain hand applied stains. That puts the finish in the wood not just sprayed on it. This allows for the fine natural wood grains to show to perfection. There are then 20 additional steps requiring the application of wax, oils and lacquers with curing times between each process. This method is performed on all furniture and wooden door and gate surfaces, inside and out. This tried and tested finish detail is required in the making of one-of-a-kind, family heirloom quality products that will stand the test of time. This process is the only way with little maintenance and the simple process of cleaning with oil will allow for a beautiful natural patina that will make this gate more beautiful over time. In fact, if it were not for these artifacts, it would be impossible to know these people ever existed, how they were important to history. This is also the case in the 21st century within your own family. No matter if it’s a simple, hope chest with your personal message or name as a gift to a loved one, or an extravagant, fine art quality, master handcrafted custom wooden driveway gate, these items will be important to the story of your family history long after we are gone. Upon request, we can add any type of hardware to your custom door or gate. This customer requested for their custom wooden driveway gate to be hung using SHUT IT! BadAss Gate Hinges. All of our door and gate products include customizable, hand forged wrought iron hardware. This hardware is hand hammered over a coal fired forge by master blacksmiths. Our blacksmiths use only pure, solid wrought iron, because unlike other metals wrought iron doesn't corrode with exposure to the elements. This combination of old world techniques and top grade materials allow us to construct high quality hardware that is virtually maintenance free. 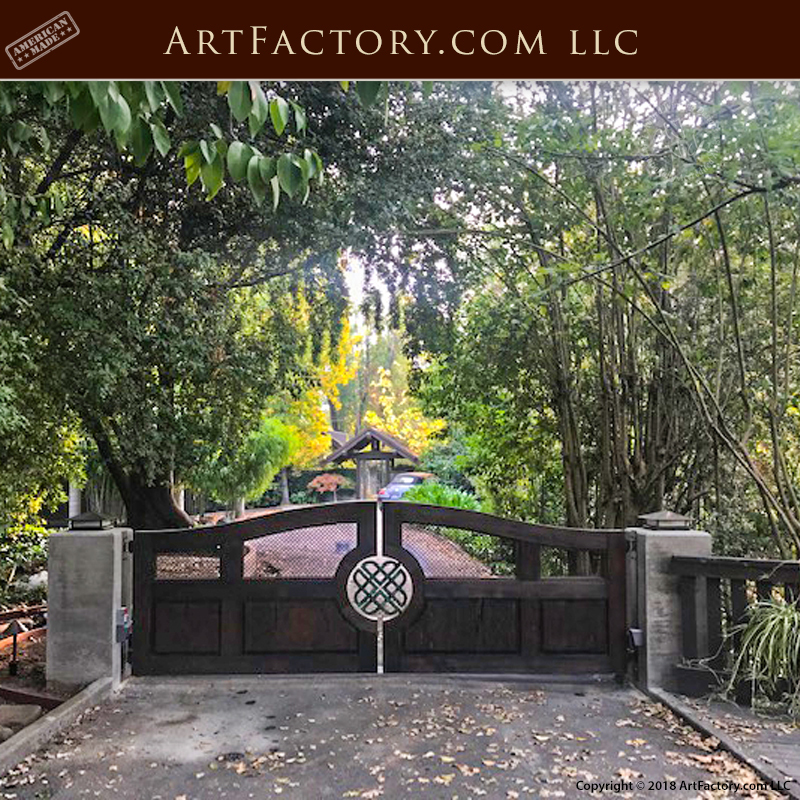 In addition to the decorative Celtic knot, this gate also features a blacksmith hand forged wrought iron flat bar around the gate, and 3/4 inch iron mesh. All wrought iron hardware products are advance patinated with a hand applied, heat infused iron oxide finish. This type of finish won't crack, flake, or peel off like paints and powder coats. Per customer request, this custom wooden driveway gate is hung using adjustable, heavy duty SHUT It! BadAss Hinges. 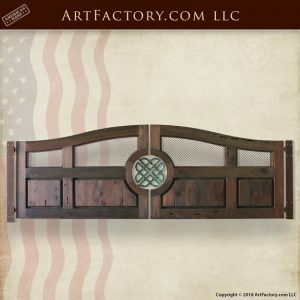 At ArtFactory.com we offer the highest quality of custom gates and gate hardware that is available anywhere at any price. Furthermore, everything is custom made to order with unlimited options in terms of style, color, and building materials. All of our custom gates are designed by and built under the supervision of award winning artist H.J. Nick. Additionally, he signs each product, once he has found it to meet all world class fine art qualifications, and is of investment quality, with future appreciable value in antiquity. To top it all off, we are so confident in the quality of our products and craftsmanship that we guarantee everything forever. When nothing but the best will do, call us at 1-800-292-0008 to get your quote for your very own custom wooden driveway gate today.